The Ministry of Agro-Industrial Policy and Food of the self-proclaimed Donetsk People's Republic has banned the import of all pork products made in Ukraine, including salo, the iconic meat product consisting of cured slabs of fatback. The decision was announced on the ministry's official website, and taken in connection with the deterioration of the situation surrounding African swine fever (ASF) in Ukraine. "Due to the worsening epizootic situation around African swine fever in Ukraine, the import of pork meat and finished pork products (salo, kielbasa, canned meats, etc.) from Ukraine into the territory of the Donetsk People's Republic, including in hand luggage for personal use, has been prohibited," the ministry said. ASF is a highly contagious virus that affects pigs, warthogs, and wild boars. In farm pigs, the virus, which has no vaccine, causes fever, loss of appetite, skin ulcers, swollen joints, abnormal breathing, coughing, and dizziness, often followed by comatosis and death. The disease has plagued Eastern Europe since 2007, when it hit Georgia, and then spread into the Caucasus, Russia, Belarus and Ukraine. Ukraine, which has a special reputation for its pork products, has been hit particularly hard, and the situation has recently worsened. Poland's Ministry of Agriculture has announced that Warsaw would build a €30 million, 729 km fence on the border with Ukraine to protect itself from Ukrainian wild boars infected with ASF from entering Poland. On September 1, Ukraine's State Service for Food Safety and Consumer Protection announced that 20 settlements from nine regions across the country had been quarantined due to the virus. 104 cases of ASF have been reported so far in 2017, already exceeding the 91 cases reported last year. An estimated 10,000 pigs infected with the virus have been destroyed, and ASF has cost farmers over 125 million hryvnia (about $4.8 million US) in losses. Observers say Donetsk's ban on Ukrainian pork products will further hit its struggling meat and poultry industry. 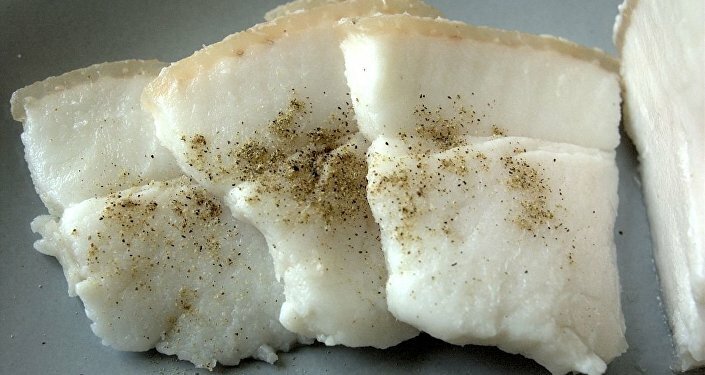 Last month, Ukrainian economists calculated that salo exports had fallen by 98% in 2016 compared to the year before, from nearly $8 million to a mere $88,000. Salo, a popular treat among the East Slavic countries, is commonly associated with Ukrainian culinary culture, and the drop in exports is seen as a very symbolic of the overall state of the country's economy. Russia has also been struggling with ASF. In June, Russia's Federal Service for Veterinary and Phytosanitary Surveillance reported that outbreaks of ASF have been registered in ten regions across the country, and threaten to spread further.